Column a little less than 5 diameters. Evidently the builders recognized that the effect produced by these first columns was stumpy and ungraceful. They found that they were too short for their height, that the diameter at the neck was much too small in proportion to that at the base, and that the first used mouldings were uncouth; and these faults they apparently set themselves to rectify in succeeding examples. So far as we can trace the dates of the Greek temple ruins-allowing, of course, for the difference in locality, which must sometimes have prevented the study, by the builders, of examples in another country-the proportions of the Doric Order show a continuous progress toward the perfection to which it finally attained in the Golden or Periclean Age, the fifth century before Christ. Theory of Derivation of Doric Order from Wooden Construction. The details of the Doric Order, and especially of the entablature, are supposed to have been borrowed from the timber framing of the smaller and earlier buildings of the Greeks, and therefore to be a copy, in stone, of the forms and parts of a wooden building. It was the theory of Vitruvius, the principal ancient writer upon architecture, that the gradual substitution of stone for wood as a building material would naturally account for certain elements in which wood construction in the Doric Order seems to be imitated in stone. He says that stone columns took the place of wooden posts, and the fluting of these columns corresponded to the chamfers of the posts. 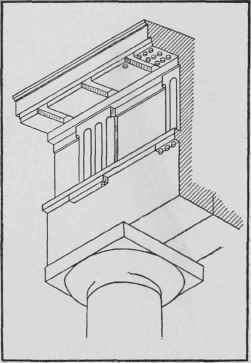 The stylobate, plinth, and base, he derives from a sill or beam on which the posts rested. The capital is merely a plate or block, intended to shorten the span of the joists resting upon the posts, and to give the joists a broader bearing upon the points of their support. The triglyphs correspond to the ends of the ceiling beams, and the void spaces between these beams are the metopes, which were at first left open for light and ventilation, and which were filled in with decorated slabs only at a later period. 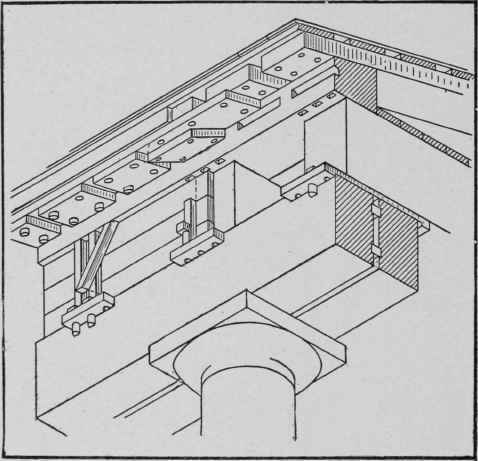 The rafters of the roof projecting beyond the frame of the building gave the suggestion for a cornice, and the mutules of the corona are the ends of these rafters. The guttae or drops have the shape of pins used in the framing of timber, while the slope of the roof itself gives the outline of the pediment. These suppositions are not beyond criticism and can indeed be met by valid objections, but they are at least plausible and interesting, taken altogether. Belittling, in a way, as this explanation seems, it appears to have had general acceptance up to the present time, and has been at least ingeniously supported by many theorists to whom it has appealed. The two cuts, Figs. 52 and 53, indicate the possible parallels in wood and stone whereby this growth may have occurred. In any case we must allow that the stone version is not a mere copy of the original, but that it has become very highly idealized in most of its parts. The tri-glyphs and metopes represent what may have been the ends of beams and the spaces between them; and the mutules-sloping as they are in most of the Greek examples-may represent the ends of rafters. Referring particularly to Fig. 52, and imagining that the column below is done away with, and that the architrave is merely the upper portion of a blank stone wall, as is shown in C, Fig. 54, we shall try to find another and more logical reason for the treatment of the frieze above it, than that one generally allowed. Another Explanation of Origin of Doric Entablature. First, we must remember that the wall below is of stone, and that it is unbroken by openings (as at 1 C, Fig. 54). It has no windows, as they would be too much exposed to the inclemencies of the weather. Across the top of this stone wall is placed a continuous band of coping (2 C), to protect its upper surface; and upon this are set a number of short. square upright posts or blocks (3 C), leaving openings between them for the admission of light and air. The beams and rafters of the roof are set immediately upon these square blocks (4 C), and the eaves of the roof overhang the wall so as to protect both it and the windows. The rafters or mutules (4 C), of course, would naturally come directly over the blocks or triglyphs (3 C), which are set on the coping or taenia (2 C); and when the porch of the temple or building is reached, the same treatment is continued; only here the lintel laid across the columns becomes the architrave instead of the upper part of a plain wall. This process of development is further supported by several bits of internal evidence. It will be found that the face of the Greek triglyph was set flush or in plane with the face of the wall or architrave below, while the face of the metope was set back from this surface in order to de-mark distinctly the corners and treatment of the triglyph. The fact above does something to support the assumption that the triglyph was not an ornament applied upon the face of the frieze, but was rather an important structural member in the support of the cornice and roof overhead. This receives even more striking corroboration in the method of constructing these stone entablatures. By referring again to Fig. 54, the section through the entablature at B, and the plan through the frieze in the entablature at A, are both taken from the Parthenon-a late example, as we have seen-and these two drawings reveal at once the fact that the triglyph itself is the most important structural block in the entire frieze. The space between, or otherwise the metope, is filled at the front by a shallow panel of marble set in between the triglyphs, and the space behind it is filled with another stone which does not exercise any direct significance upon the construction of the entablature.